Watkins Glen, NY – Andrew Nixon, Executive Director of the Chautauqua County Visitors Bureau, was recognized for his excellence in service as Treasurer of the New York State Tourism Industry Association (NYSTIA), during its annual business meeting held October 26 and 27 in Watkins Glen, NY. Mr. Nixon has served as Treasurer since 2014, when NYSTIA was formed by the merger of the New York State Travel & Vacation Association and the Tourism Promotion Agencies Council of New York State. His term as Treasurer comes to a close as of the end of this year, but Mr. Nixon will remain on the volunteer board as a director. According to Jill Delaney, NYSTIA President and CEO, Mr. Nixon's guidance and advocacy during and after the merger played an important role in ensuring the new association's success. “Andrew has been a dedicated manager of the association's finances, ensuring that we started on steady footing with the necessary stability to grow. He is a trusted and well-regarded professional in the New York State tourism industry, and we are fortunate to have him be among our leaders sitting at the table." 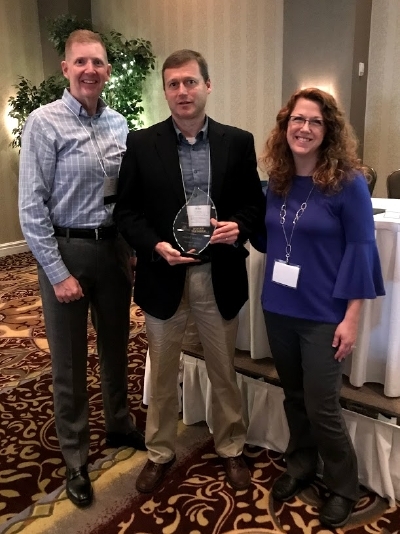 Ms. Delaney and Awards Committee Chairperson Patrick Kaler presented Mr. Nixon with the award during the membership breakfast hosted by TripAdvisor at the Watkins Glen Harbor Hotel on October 27. NYSTIA's Excellence in Service award recipients are nominated each year by fellow NYSTIA members and are voted on by committee. Awards are presented in conjunction with NYSTIA's Annual Meeting and Tourism Excellence Awards Dinner. Nominees are considered based on their support of and service to NYSTIA's mission of collaboration, research, legislative awareness and exceptional marketing on behalf of the statewide tourism industry. The previous evening, winners of the 2017 Tourism Excellence Awards were announced during ceremonies at The Glen Club of Watkins Glen International. Recipients were presented with awards, sponsored by AAA Magazines. Meredith Travel Marketing provided a reception for the honorees and attendees, followed by a dinner, hosted by Advance Media New York.